Are you ready to be your own boss and work from home? Are you unsure of how to get started? 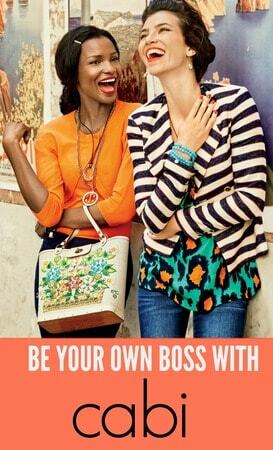 If you're interested in a home business opportunity that mixes fashion and fun — cabi has what you're looking for. Blending stylish clothing with personalized in-home fashion experiences, cabi gives Stylists all the tools they need to be successful. As a cabi Stylist you can earn 25% – 33% commission on items you sell, plus substantial discounts on clothing. One of cabi's training tools for Stylists is their bi-annual Runway Event called, The Scoop. During this high-production fashion event, Stylists are introduced to the new clothing line and given in-depth training to be successful. Would you like to see what cabi's all about? Now you can! On Thursday, January 14th at 4:00PM PT – I'll be broadcasting live from The Scoop. To follow along search for the hashtag, #cabiScoop on Instagram and Twitter. Then on Friday, January 15th you can watch the broadcast from The Scoop Fashion Show in the comfort of your home – register here. Here's a sneak peek of the cabi clothing 2016 Spring Collection — can't wait! For more information on cabi, check them out on Twitter @cabiclothing, on Instagram @cabiclothing, or via the cabi website. And if you have any questions about the cabi business opportunity – feel free to leave them below and I'll get you the answers you need. This post was sponsored by cabi. Please be aware that we can only promote advertising from companies that we feel we can legitimately recommend to our readers. For more information please see our disclosure policy.